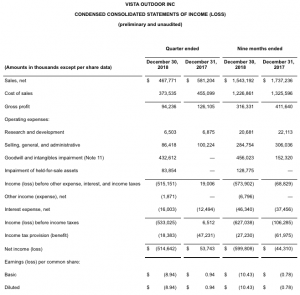 Vista Outdoor lowered its revenue guidance for its fiscal year ended March 31 after reporting sales dropped 20 percent in the third quarter. The company posted a loss of $514.6 million, or $8.94 a share, on a massive goodwill write-down but said earnings before charges exceeded Wall Street’s consensus estimates. 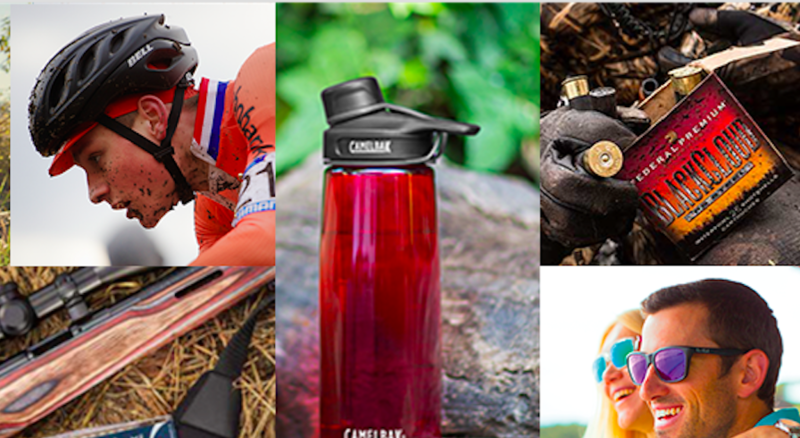 The company’s brands include Federal Premium, CamelBak, Savage Arms, Bushnell, Camp Chef, Primos, BLACKHAWK, Bell and Giro. Sales were $468 million, down 20 percent from the prior-year quarter, down 13 percent on an organic basis excluding results from our recently sold Bolle, Serengeti and Cebe brands. Wall Street’s consensus target had been $505 million. Operating expenses were $609 million, which reflects a pre-tax, non-cash goodwill and intangible impairment charge of $433 million and an $84 million impairment related to an expected loss on the sale of the company’s held-for-sale assets. This compares to $107 million of operating expenses in the prior-year quarter. Adjusted operating expenses were $80 million compared to $103 million in the prior-year quarter. Including the pre-tax, non-cash goodwill and intangible impairment charge, fully diluted earnings per share (EPS) was $(8.94), compared to 94 cents a share in the prior-year quarter. Adjusted EPS was 9 cents a share , compared to 13 cents a share in the prior-year quarter. Wall Street’s consensus estimate on an adjusted basis had been 6 cents. The guidance does not include the impact of any future strategic acquisitions, divestitures, investments, business combinations or other significant transactions. Non-recurring items in both periods are summarized below. During the quarter ended December 30, 2018, we recognized a $433 million total impairment of goodwill and identifiable intangible assets. 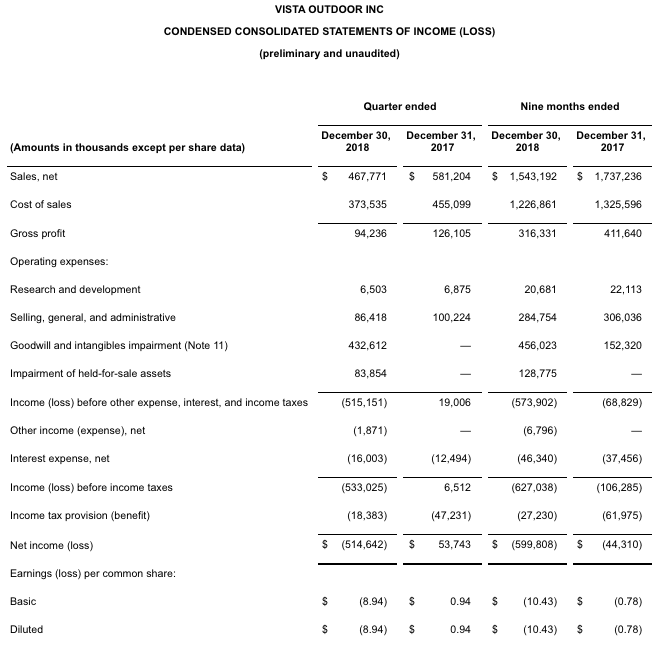 The trading price of our common stock declined significantly in the quarter ended December 30, 2018, increasing the difference between the market value of Vista Outdoor equity and the book value of the assets recorded on our balance sheet and implying that investors’ may believe that the fair value of our reporting units is lower than their book value. In addition, as a result of a weaker than expected 2018 holiday shopping season and increasing uncertainty from the impact of retail bankruptcies, tariffs and other factors affecting the market for our products, we reduced our sales projections for fiscal year 2020 and beyond for a number of our reporting units for purposes of our long-range financial plan, which is updated annually beginning in our third quarter. As a result of these factors, we determined that a triggering event had occurred during the quarter with respect to our Hunting and Shooting Accessories, Outdoor Recreation, and Action Sports reporting units, which required that we assess the fair value of these reporting units using the income-based and market-based approaches described above. Given the unusual and infrequent nature of this impairment we do not believe these costs are indicative of operations of the company. The tax effect of the goodwill and intangibles impairment charge was determined based on the fact that the goodwill impairment charge of $328 million, a portion of which was non-deductible and the remainder was deductible at a rate of approximately 24 percent for tax purposes, and the remaining intangible asset impairment of $105 million was deductible at a rate of approximately 24 percent. The current quarter impairment caused the company to be in a three-year cumulative loss position, which resulted in a valuation allowance on deferred tax assets to be recorded. Given the unusual and infrequent nature of this valuation allowance, we do not believe the $29 million tax expense related to the valuation allowance of the deferred tax assets is indicative of operations of the company.